Que je tenois aussi cher que ma vie. Sans se lasser punisse ta folie. Pour se sauver, estraignit à son col. Which I kept as dear as my life. May she tirelessly punish your folly! Tightened round his throat to save himself. – Archilochus was a Greek poet. Lycambes betrothed his daughter to Archilochus. but then broke the engagement; in response, Archilochus wrote a lot of angry verse about it, and Lycambes and his daughter – and perhaps others in the family – committed suicide as a result of the publicity. The poem itself is a very good one, in my view. As usual, it took a while to reach this form; here is Blanchemain’s earlier version, in line 4 of which we have a characteristic new verb-from-adjective coinage by Ronsard which (also characteristically) he eliminated in later years. Note that the opening quatrain works completely differently, now a series of invocations of punishment rather than a statement of guilt. Why would a heart ‘rust’? 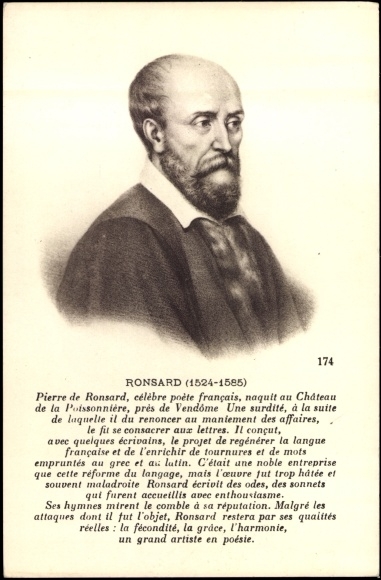 It would be made of cold, hard iron – or at least that is the insult which I imagine Ronsard is implying. Qui bienheuroit le plaisir de ma vie. Pour se sauver estreignit à son col. Which brought good fortune and pleasure to my life. Je ne veux chanter que d’amours. Que je vive autrement qu’ainsi. Ni de ses rets se deslier. I want only to sing of love. That I should live any other way than this. Or to escape his nets. Born to be in no way idle. Let my hair grow grey. Estienne Pasquier is a figure we’ve met before: here, Belleau notes ‘Advocate general of the Chambre des Comptes in Paris, of whom we can offer no better evidence than his own [poetical] works provide, and our poet in this place who has truly pinpointed his talent’. It’s a nice self-denying poem by ROnsard, praising his friend for his high-flown, learned poetry (Minerva is the goddess of wisdom), while putting himself down as a mere love-poet.